Out of all the oral problems a person can face in their lifetime, tooth loss is considered to be one of the most devastating. After all, it affects not only your self-image, but your oral health as well. 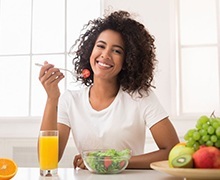 Patients who leave gaps in their smile untreated for too long experience a higher risk of periodontal disease and additional tooth loss, and even simple activities like eating and talking can become more difficult. In fact, tooth loss is one of the leading reasons why older individuals experience malnutrition. Since they are missing teeth, they are unable to eat the foods that are an important part of a healthy diet. Here at Water’s Edge Dental, Dr. Sean Bannan takes this issue very seriously. That’s why he offers several restorative options that can recreate your missing pearly whites in a comfortable and lifelike way, such as dentures and bridges. However, dental implants have become the true frontrunner in the tooth replacement race, thanks to their valuable health benefits, their stability, and their natural look. In fact, many patients who’ve received implants even forget that they’re not natural teeth after a while! If you’re ready to find out more, call to schedule a tooth replacement consultation with the skilled Water’s Edge Dental team in South Daytona today. We’ll review your treatment options and help you plan to recreate your flawless, natural smile. Dental implants in South Daytona consist of two crucial components. There’s the personalized crown, which is the visible portion of the tooth. Keep in mind that most tooth replacement options only provide this component to patients. For example, fixed bridges and partial/full dentures only rest on top of your gums and do not go any further. 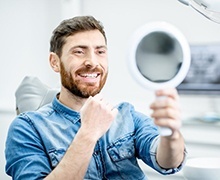 In contrast, dental implants take your treatment a step further by also offering a small, titanium post that serves as your missing tooth’s new root. When your natural tooth dies, you lose that original root as well, and the jawbone begins to deteriorate. As this happens, your facial appearance may begin to alter and give you a more haggard and older look. Dental implants effectively solve this problem by providing a replacement that helps keep the structure of your face full and properly functioning. Implants are the only self-supporting restoration option that replaces both the tooth roots and crowns to fully restore your smile. Once in place, a dental implant-supported replacement tooth or teeth can last two decades or longer. With proper care, you may be able to keep your newly restored smile for a lifetime. After 20 years, dental implant-supported tooth replacements have a success rate between 90 and 95%. Because both the roots and crowns of missing teeth are replaced, implant-supported replacement teeth function more like a natural smile. That means you can eat all of your favorite foods and speak and smile with confidence. Implant-supported replacement teeth look much more like healthy teeth, so you know you can smile confidently in every situation. Traditional tooth replacement options need to be supported by surrounding teeth and oral structures, which can cause unnecessary damage and strain to oral health. Implant-supported replacement teeth are fully self-supporting. First, you’ll need to undergo a surgical process, during which your new tooth “root” will be inserted into the empty socket. Once this has been completed, a period of healing will be necessary; during this time, your new root will organically merge with your jawbone, creating a steady foundation for your restoration. Dr. Bannan cautions against smoking if you want to have dental implants as this will impede the healing process. Once we’ve determined that you’re ready, you’ll come to our South Daytona, FL office so that Dr. Sean Bannan can place your brand-new, beautiful crown on top of the post, completing your look and restoring the much-needed form and function to your smile. 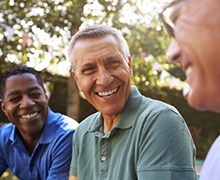 With dental implants, South Daytona residents can look forward to a high success rate, and as long as they’re cared for through oral hygiene and regular check-ups, they have a good chance of lasting for a lifetime. Better yet, their durability allows you to bite and chew just like normal, and their natural look will blend right in with your existing smile. 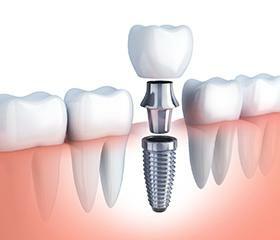 Dental implants are ideal for replacing multiple teeth at a time, not just individual teeth. Take a moment to look over the different methods in which our office can restore your smile! Those missing single teeth only require a single titanium post and one porcelain crown. We use porcelain not just for it’s lifelike aesthetics, but incredible durability. If you’re missing more than one tooth, a fixed bridge can be customized to fit on top of two implant posts. Instead of needing to buff down existing tooth enamel for a bridge to fit on top of, an implant-retained solution can simply hold the three- or four-crown bridge. This option is especially ideal for those who do not want to make modifications to their natural teeth. Those who are missing all teeth can benefit from an implant-supported denture. With just four to six implants, you can support either a partial or full denture, depending on your needs. They can also be designed to be fixed or removable if you’d prefer one over the other. One of the other important factors you need to address during your implant tooth replacement plan is the cost of your dental implants. Implant-supported tooth replacement plans are completed over the course of several phases of treatment. The initial phase is the surgical implantation of one or more implant posts. Then, you’ll need to wait several months as the implant posts fuse with your supportive structures. Once implants are firmly in place, we place your abutments. These are the connectors that anchor your replacement tooth or teeth. After placing the abutments, we capture impressions and design your replacement teeth. Finally, we semi-permanently attach your dental crown, bridge, or denture to the abutments, leaving you with a flawless smile. 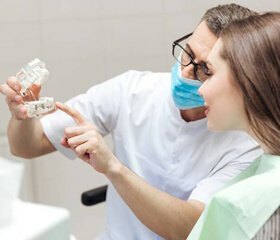 Depending on the number of implants used, treatment materials, and type of restoration, your implant-supported tooth replacement plan can cost between $3,000 and $30,000 or more. During treatment planning, we’ll help you budget for the costs of each step of treatment, understand how to maximize insurance coverage, and assist you in accessing low and no interest financing options to meet your needs.